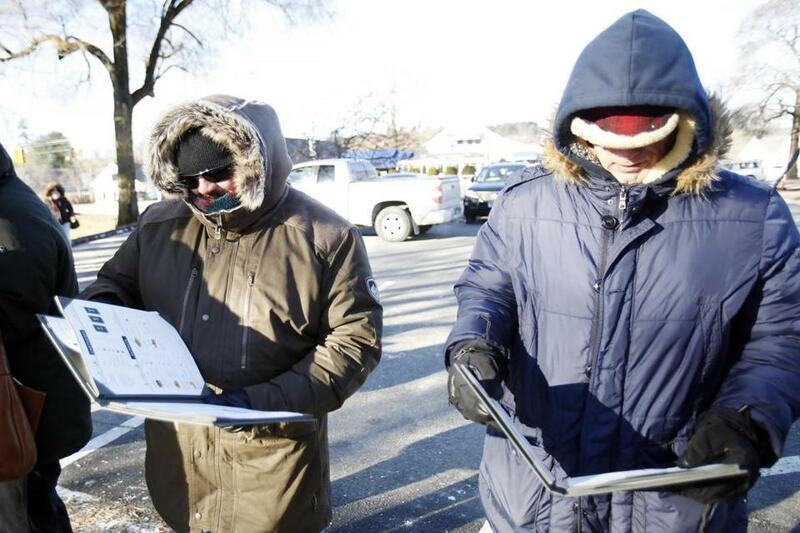 Customers check out the menu as they wait in line in the cold on the opening day of recreational marijuana sales at Theory Wellness in Great Barrington on Jan. 11. The weekend’s winter storm had two — seemingly opposite — effects on recreational marijuana sales, with customers spending a record-breaking amount of money Saturday, followed on Sunday by one of the slowest days for recreational sales since stores opened in November. Customers spent $681,053 Saturday on 15,790 recreational marijuana products, breaking a record with both totals, according to the data from the state’s Cannabis Control Commission. Seven stores were open across the state on Saturday. On Sunday, recreational sales began at an eighth store, Northeast Alternatives in Fall River, though at least one store, Temescal Wellness in Pittsfield, closed because of the weather. Across the state, the cold temperatures and rainy weather seemingly deterred customers Sunday, who spent just $188,525 on marijuana products. The only day marijuana sales were lower was New Year’s Day, when revenue hit just $156,557. Since the opening of the first two recreational stores in November, Sundays have been traditionally lower days for revenue than Saturdays, though not usually by such a large margin.